Mark J. Cares, Speaking the Truth in Love to Mormons, Milwaukee, Wisconsin, WELS Outreach Resources, 2nd edition, 1998, 313 pages, ISBN 1893702065, (paperback). Speaking the Truth in Love to Mormons was written to help Christians 1 effectively communicate the historic Gospel of Jesus Christ to members of the Church of Jesus Christ of Latter-day Saints (LDS Church). This particular method developed over the years by the outreach ministry of the Messiah Lutheran Church and its pastor, Mark J. Cares in Nampa, Idaho. In the preface, Pastor Cares asserts two major elements that differentiate this book from other books written with similar intentions. 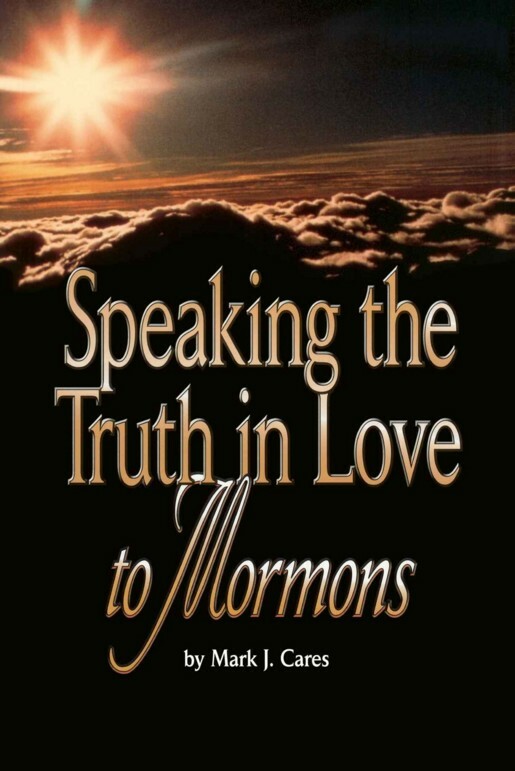 "Speaking the Truth in Love to Mormons was written to help Christians effectively communicate the historic Gospel of Jesus Christ to members of the Church of Jesus Christ of Latter-day Saints (LDS Church)." First, rather than referencing historical LDS church documents; he limits his citations to current authoritative LDS publications, such as the Gospel Principles, Ensign, conference talks, etc. His rationale is that these contemporary works will not only educate his reader on some of the current teachings of the LDS church leaders, but are also the ones Mormons are most familiar with, and will, therefore, help his reader identify with Mormons. Second, Cares says that most strategies for witnessing to Mormons focus on a thorough examination of either the “history of Mormonism or the nature of God” (p. 5). And that at least one major weakness common in both approaches is their reliance upon “human reason rather than on the power of the gospel to bring Mormons to faith in Jesus” (p. 6). Quoting 1 Corinthians 2:14, Cares says, “The Bible clearly teaches that people do not have the ability in and of themselves to make rational decisions to accept Christ.” (p. 6). Therefore, Cares proposes that the best witness approach is to make the Gospel of Jesus’ saving work the center of discussion by relying on the power of God’s Word to convert rather than relying on human reason in debating Mormon history or the nature of God. Emphasizing this one-step soul-winning approach as being the most effective strategy, Cares says, “Getting people out of Mormonism, but not getting them into Christianity, does them no good. They still are on the way to hell.” (p. 178). It seems one of the main reasons Cares favors this one-step approach as the only right approach is his assumption that an approach must move a person from compete unbelief to belief in one step. Faith Has Its Reasons2 suggest emphasis upon this one-step approach may be misplaced. The validity of the apologetic does not depend on its success, but on its utility in facilitation success through the hidden illuminating work of the Holy Spirit within non-Christians. On this premise, we favor the view that an apologetic is valid and valuable if it provides the basis for a non-Christian moving at all closer to embracing the Christian faith. People are indeed either dead in sins or born again, lost or found, unjustified or justified. But they may be closer or further away from crossing over from life to death, depending on what they believe or do not believe. People are typically not standing still: they are generally either moving toward faith or toward unbelief. Many witnessing experiences support the above assertion made in Faith Has Its Reasons. For example, when a rational argument concerning the nature of God moves a person from complete unbelief to belief that there is only one God3 (28 Bible Passages Teaching One God), then that person has indeed moved in the right direction. Rational arguments from the Scriptures are an effective witnessing tool, but more importantly, they are biblical. In fact, it was the custom of the apostle Paul to reason from the Scriptures with unbelieving Jews in the synagogues. “And Paul, as his manner was, went in unto them, and three sabbath days reasoned with them out of the scriptures.” (Acts 17:2, see also 18:4, 19; and 24:25). In recognition of the need to give at least a minimal rational argument against some common claims of Mormonism, Cares includes a 12-page chapter (chapter 11) that replies to some of the typical arguments for Mormonism. Also, in the Preface Cares especially recommends Jerald and Sandra Tanner’s tome entitled, Mormonism—Shadow or Reality? The main point in Cares’ approach is to prepare Mormons for hearing the biblical Gospel of Jesus Christ by first getting them to realize their sinful nature and how futile it is to strive toward obtaining a “state” of perfection by following all the laws and ordinances of Mormonism. Cares says, “If they view Mormonism as a heavy but manageable burden, we need to make that burden so heavy it crushes them.” (p. 186). Cares says, “A common mistake Christians make is to focus on the gospel before the law has done its work.” (p. 186). Cares describes at least three areas in which we can show Mormons the futility of trying to be perfect, but he is convinced that a though discussion of Matthew 5:48 “is the most effective way of bringing God’s law to bear on a Mormon.” (p.189-90). “Be ye therefore perfect, even as your Father which is in heaven is perfect.” (Matt 5:48). Since the LDS church leaders stress “becoming” rather than “being” perfect, Cares says “the point we need to make with Mormons is that Jesus commands us to be perfect, not to become perfect as Mormonism teaches.” (p. 190). Once the law has done its work of showing the helpless sinful nature of humanity, Cares suggest then focusing on the Gospel of Jesus Christ. Cares says, “In my estimation, the one section of Scripture that most effectively presents the gospel to Mormons is Hebrews 10:10-18.” Hebrews 14 clearly states that Christians have already been perfected by Jesus’ sacrifice on the cross—this is the doctrine of justification. In order for Mormons to understand the Gospel of Jesus Christ, it is essential they understand the doctrine of justification. Unfortunately, Cares provides only a dictionary entry (p. 278) and the following one short paragraph explaining justification. Since Cares leans so heavily upon contrasting believers being justified because of Christ’s work on the cross and Mormons’ futile attempt of becoming perfect by following all the laws and ordinances of Mormonism, I think he should have devoted more attention to explaining the doctrine of justification. 1. “According to the Bible, Christians are persons who trust that they have eternal life, not because of anything they have done or have to do, but solely because of the merits of Jesus Christ.” (p. 6). Cares cites Romans 4:5 and Ephesians 2:8-9 in support of this definition. 2. Kenneth D. Boa and Robert M. Bowman, Jr., Faith Has Its Reasons. (Colorado Springs, CO: NavPress, 2001), p. 540. 3. “MONOTHEISM. The belief that there is only one God. Related terms are polytheism (the belief that there are many gods), henotheism (belief in one supreme god, though not necessarily to the exclusion of belief in other lesser gods), monolatry (worship of only one god, though not necessarily denying that other god exist), and atheism (denying or disbelieving in the existence of any gods at all).” Evangelical Dictionary of Theology, ed. Walter A. Elwell (Grand Rapids: Baker Book House, 1984), s.v. MONOTHEISM.